Egypt's High Constitutional Court declares that it is not party to any political conflict in a statement issued by the court's general assembly Monday afternoon. "The scope of its sacred mission remains to protect the provisions of the constitution and to prevent any aggression against or violation of them," reads the statement. The general assembly of Egypt's High Constitutional Court (HCC) held a meeting early Monday to discuss President Mohamed Morsi's decree reinstating the People’s Assembly (the lower house of Egypt's parliament), which was dissolved last month by order of the military. The Supreme Council of the Armed Forces (SCAF) dissolved parliament's Islamist-led lower house in mid-June, following an HCC ruling that found Egypt's parliamentary elections law – which regulated last year's legislative polls – to be unconstitutional, and declared the current parliament null and void. In its statement, the Court added that its decisions "are final and not subject to appeal, and that its provisions in cases of constitutional interpretation and decisions are binding on all state authorities." Egypt's highest judiciary authority stressed that it is not a party in any political struggle that arises between the political forces and will not be used by any political force against another. According to the HCC statement, it has received a number of lawsuits challenging the president's decision to reinstate the dissolved parliament. "The HCC is the sole arbiter in all disputes relating to the implementation of its judgments and decisions," the statement reiterates. I dont know the details but maybe there is a lessen from the German Reunification that may be appli cable here too: There are times when a case may be not perfect in the light of constitiutional law but to trash it would be even more against the constitution according to the Ge. Now we have a decision by the German Constitutional court. The Constitutional Court of Egypt has spoken for the second time but Courts are not so important as the constitutional life of a nation. The military is still capable to handle the situation with brave so Egypt is not yet in danger. Please be patient with the parliament, it is much better than nothing. There must be some more or less official representation of the people in a nation and it does not gouvern or whatever forever. The top judges should be retired. They could not hold Mubarak to account. On the contrary they have been and are part of the deep military state. The middle ranking lawyers should decide who should replace these discredited judges. The same for the SCAF leadership. The same process should apply. Cancel the umbilical chord to USA interests by refusing the military aid. This confirms that the HCC should be transformed. All the senior judges who legalised the fraud associated with the Mubarak era should be retired. The judiciary however should make recommendations as to who their replacements should be. The same should apply to the SCAF leadership. They are still celebrating their exploits in 1973. At the moment the SCAF leadership is serving foreign i.e. USA interests. They should be retired and the army sent to barracks. A new tier of army leaders should craft a strategy to defend the territorial integrity and national sovereignity of Egypt. The military aid from the USA should be stopped immediately and Egypt review its role. One of its biggest external; threats is the water from the Nile having to be renegotiated. As for the economic interests of the army they should be nationalised. Your insight into the core issues and possible ramifications is outstanding. Very well expressed. Dissolve this shameful residue of the decadent past and fire the robed lizards who have spent their lives serving dictatorship. This High "Constitutional" court was SELECTED by the UN-DEMOCRATICALLY selected Hosni Mubarak. In democratic societies, a democratically-elected president chooses high court justices/judges, who must be ratified by a democratically-elected parliament. Mubarak's parliaments were fraudulent. The SCAF is NOT democratically-elected. ONLY Pres. 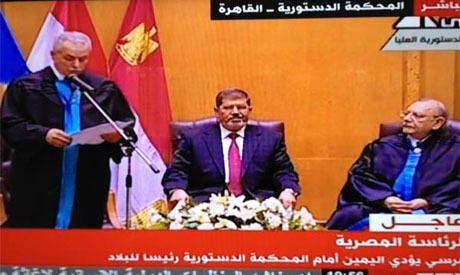 Morsi and the Parliament are democratically elected in Egypt. The two remnants of the Mubarak regime, SCAF and the High Court, CANNOT overturn what the Egyptian voters chose in free elections. Didn't the New York Times publish an article on how Judge Tahani al-Gibali, a Mubarak appointee, was advising the SCAF? P.S., NOBODY has ever voted for Judge Tahani al-Gibali, J. Maher al-Bohairi, et al.